The number of mobile internet users is going to reach 155 million in India by the end of March 2014, and 185 million by June, maintaining a quarter-on-quarter (Q-o-Q) growth of 20 per cent, according to a report released by the Internet and Mobile Association of India (IAMAI) and market research firm IMRB International. The report further mentions that this number was 130 million as of the end of last month, and 110 million as of October 2013, of which 85 million users were from urban India and the rest from rural India. Going forward, urban India will continue to account for a large percentage of the mobile internet users and is expected to reach 126 million by March 2014 and touch 153 million users by June, accounting for over 82 per cent of the total mobile internet users. In comparison, the number of mobile internet users in rural India will register an impressive 50 per cent growth to reach 32 million by June 2014. Interestingly, across both urban and rural India, over 50 per cent of the active internet users are accessing internet on their mobile, apart from other sources, indicating that there has been a huge uptake in consumption of the mobile internet medium. The average revenue per user (ARPU) has dropped around 16 per cent to Rs 387 from Rs 460 in 2012. However, the 'percentage amount' spent on mobile internet has gone up to 45 per cent from 43 per cent in the same year, indicating that more and more people prefer communicating over the mobile phone. 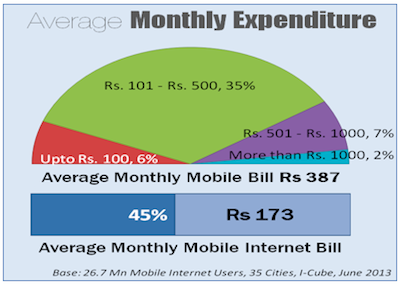 According to the report, 35 per cent of the mobile internet users are spending between Rs 100 and Rs 500 monthly on their phone expenses. In addition, 9 per cent are spending over Rs 500 and just 6 per cent of the users are spending less than Rs 100 every month (see table). 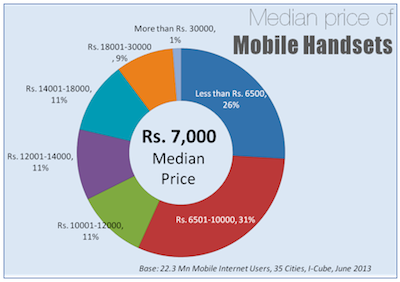 The report also finds that the median price of a handset had fallen 15 per cent from Rs 8,250 in 2012 to Rs 7,000 in 2013. This was attributed to the reducing prices of phones with advanced features, and the fact that more and more manufacturers are trying to target the 'Value for Money' segment by offering more features at lower prices. In an earlier report (named I-Cube 2013), IAMAI had mentioned that India will have 243 million internet users by June 2014. It means that by that time, India will overtake the US as the second-largest internet base in the world. China currently leads with more than 300 million internet users, while the US has 207 million. According to this number, by June this year, mobile internet users will account for over 60 per cent of the total internet users in the country. While we do not have current figures for the same, according to the Telecom Regulatory Authority of India (TRAI), as of October last year, there were 875.48 million wireless telecom subscribers in India. During the same time, there were around 110 million mobile internet users in the country. What this basically means is that only about 13 per cent of the total number of telecom subscribers were actually accessing internet via their mobile phones. Hence, while the estimated 185 million number is impressive, the mobile internet penetration in the country will still remain low (considering the number of telecom subscribers will also increase in the Jan-July 2014 time period).